ISLE OF ARRAN, built by Ferguson-Ailsa in 1984 at Port Glasgow for Caledonian MacBrayne's Ardrossan-Brodick service, is currently employed on her owner's Islay services from Kennacraig. She has, for the past few years, partnered a similar but slightly newer ship, HEBRIDEAN ISLES, on the runs to Port Ellen and Port Askaig during the summer months. Later this week, HEBRIDEAN ISLES will probably be visiting the Clyde for some remedial work to her bow ramp, which sustained some damage recently. 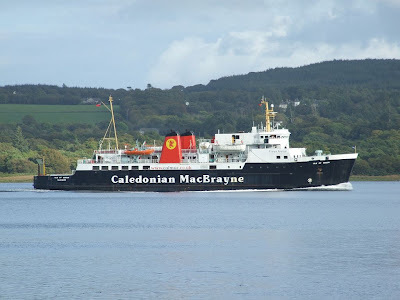 It seems likely that this work will be carried out by the Garvel Drydock and CalMac are advising their Islay customers that a single-ship service will be in operation between Thursday 6 and Tuesday 11 September. In the meantime, HEBRIDEAN ISLES has continued in service, but using her stern ramp only.